To modify a resource that has already been defined, click Tools > Manage Resources… from the menu bar. The Project Resources window opens. Select the resource from the list of Existing Resources. At this point, theModify… and Delete buttons become enabled. 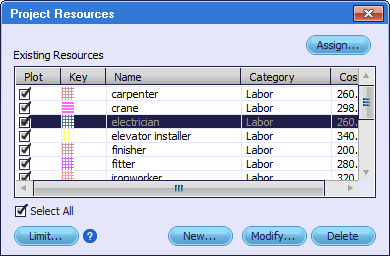 The Resource Properties window opens, showing the several resource fields filled in according to the current properties of the resource. After making any changes, click the Update button and the Resource Properties window will reset. Click the Exit icon to close the Resource Properties window.